in the construction industry for the past 4 decades. It is our desire to continually grow and adapt to the ever-changing world of construction innovation. With our exclusive guide you will be able to fully grasp what is on the horizon for the construction industry. From augmented reality to mobile technology we cover the most essential technologies to help you get the job done quickly, efficiently, and at less cost. to the ever-changing world of construction. Not all new technologies are created equal. 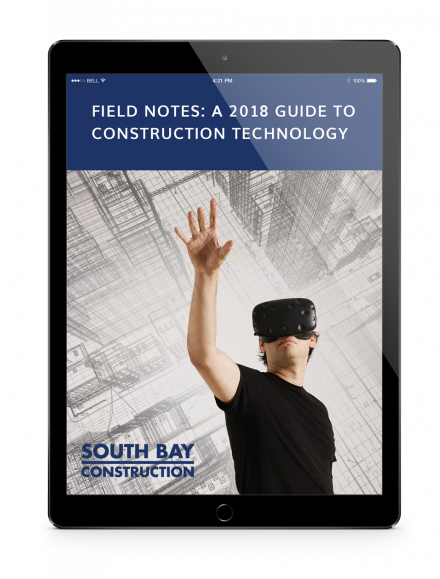 With our FREE downloadable guide, South Bay Construction can help you understand what technologies you should invest in and what devices are worth your time. Field Notes: A 2018 Guide to Technology has the information you need to prepare yourself for technology changes in the real estate development and construction industry. With our FREE downloadable guide, South Bay Construction can help you make sense of the latest and greatest technology trends. Through our meticulous research, we have documented what you need to know, and how you can make 2018 the most innovative year yet.